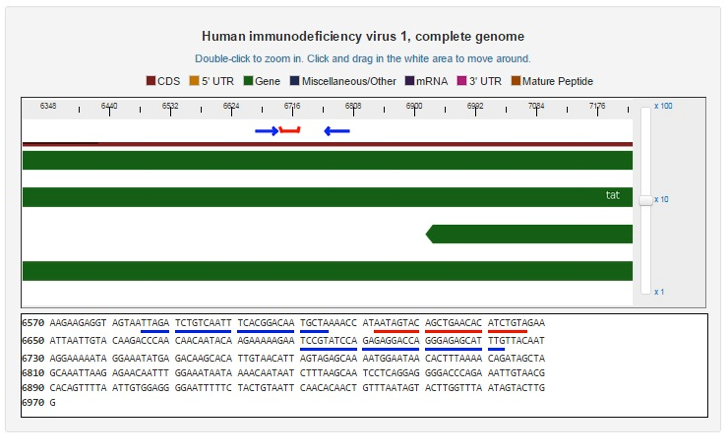 The Genome Viewer allows a user to visualize hits in ThermoBLAST CE. This picture shows a positive hit against the intended HIV 1 target which is used as a “sanity” check to make sure that probes are binding the intended amplicon as it is shown between the two primers. Other information from the Genome Viewer shows gene topographical information such as the 5’ Untranslated Region and Mature Peptides. Finally, there is also a sequence view which shows the target context around your intended amplification site. The magnification of the target can be manipulated by the slider bar to the right of the picture.